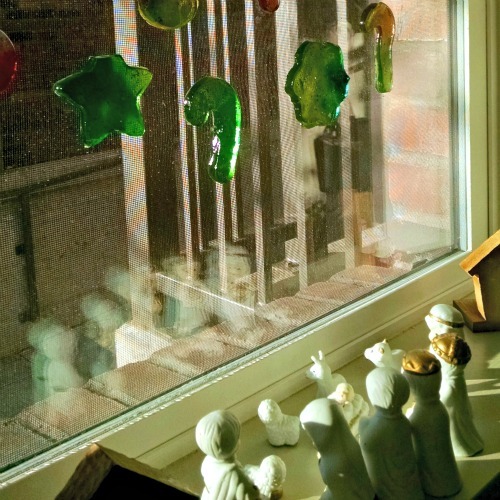 Make your own winter and Christmas window gel clings with just a few kitchen ingredients. 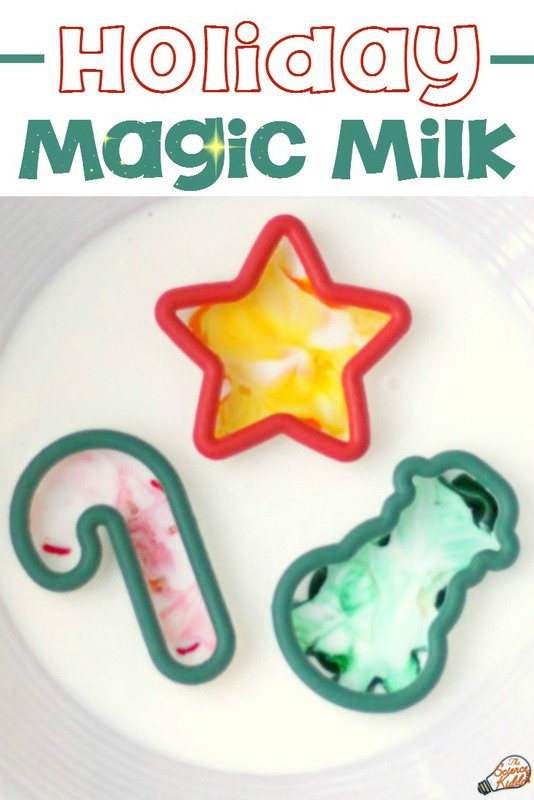 They are festive decorations for the holidays and make for a really fun afternoon crafting and learning with the kids. 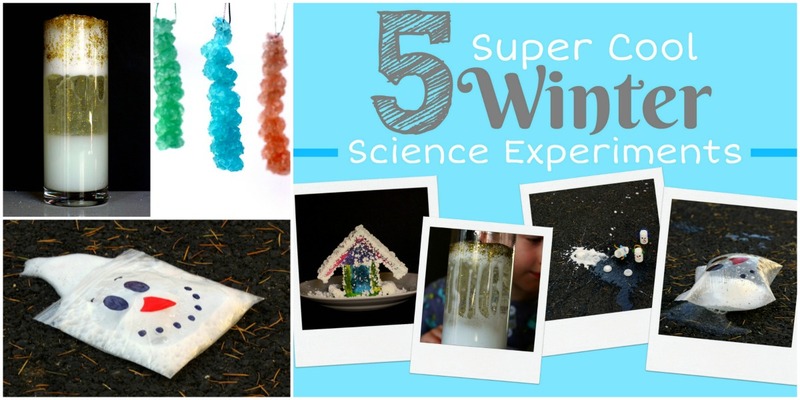 It’s the perfect art and STEM activity for grandparents, parents, and caregivers to do with their kids during the winter break. Making your own Christmas window gel clings is super easy. They are even edible if you leave the glitter out so that your youngest helpers can participate. 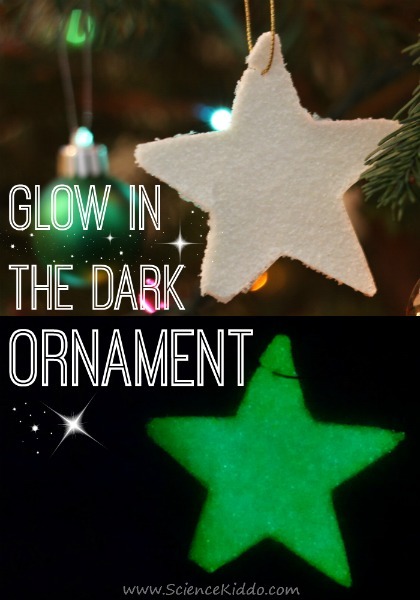 Festive cookie cutters – Use these to make borax crystal ornaments, too! Since this activity involves hot water I did a little bit of prep before inviting the kids over. I boiled the water and then added gelatin into it. It took a little bit of stirring and whisking to get all of the gelatin dissolved. Once the powder was dissolved I spooned out the bubbles. Carefully, I poured the gelatin mixture into the baking sheet and spooned out the remaining bubbles. It was about a quarter of an inch thick (½ – ¾ cm). 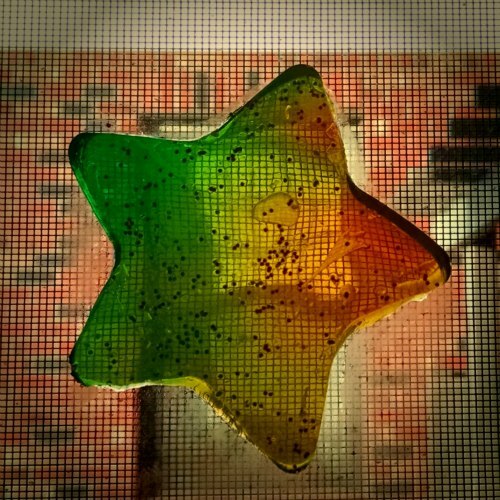 After about 10 minutes the gelatin was cooled down enough that I felt comfortable inviting the kids over to create their Christmas window gel clings. The kids couldn’t wait to dive in! They took turns dropping food coloring into the gel and swirling it around with a toothpick. My daughter loved sprinkling her section with a generous dusting of glitter to make it sparkle. The gelatin hardens as it cools. We had about 30 minutes to decorate the gelatin before it was too thick to color anymore. 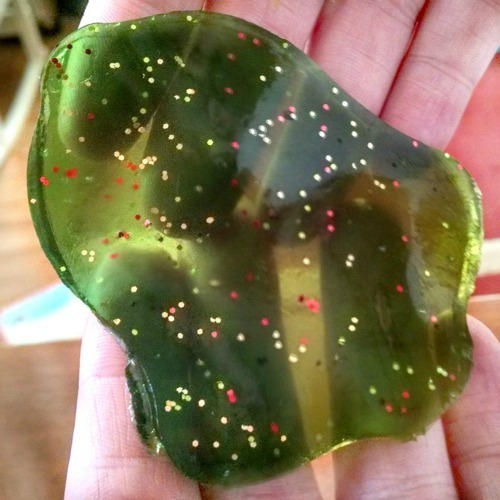 Once the kids were done with the coloring/glittering phase, we left the gelatin to harden overnight. We left it uncovered so that it dried out just enough. The next morning we came back and used cookie cutters to make festive shapes. My husband used a spatula to carefully lift the shapes out of the pan and set them into the kids’ hands to place on the windows. The kids had a blast arranging their decorations on the windows for everyone to enjoy! 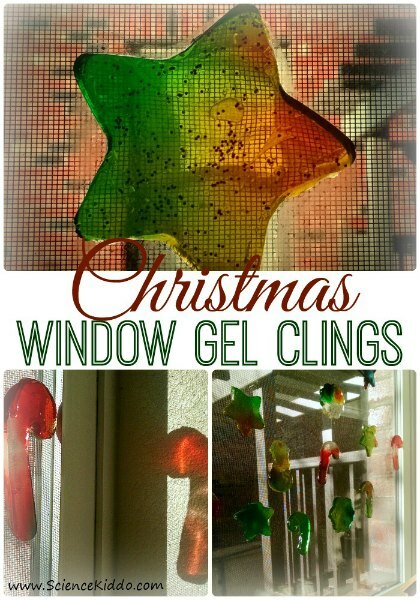 *Please Note: I have had some readers say their gel clings were too wet or heavy and didn’t stick to the window. If this happens to you, simply leave your pan of gelatin out uncovered overnight and try again in the morning. If they are still too heavy, leave them again until the next day. 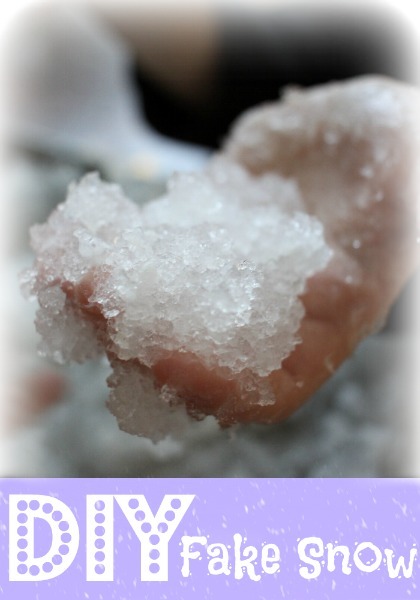 Each day, water evaporates out of the gelatin, making it stickier and lighter and more likely to stick to your window! Also, they stick better to cold windows than to hot ones, so you may have more success putting them up in the morning when the windows are the coldest. I love how these Christmas window gel clings catch the rare rays of sunshine during the winter. They light up our front room with beautiful shapes and colors! When you are ready to remove the window gel clings, simply use a cloth and warm water to scrub them off. Some window clings can be more persistent and require the use of a razor blade to get them off the window, but often, they dry up and fall off on their own within a few days. It really depends on the temperature and humidity where you are! 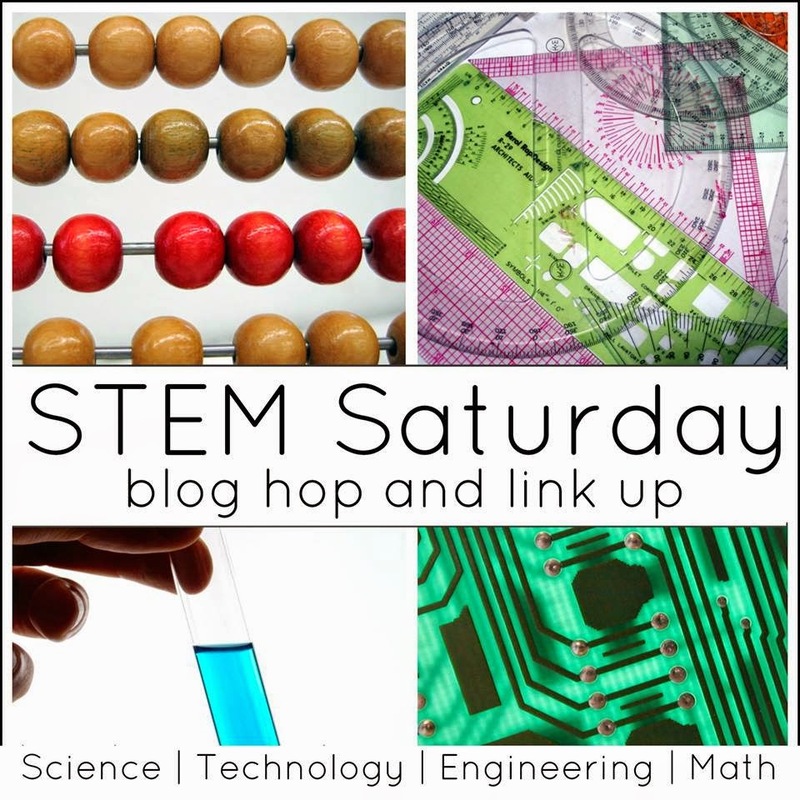 In addition to being a fun art/sensory/family bonding activity, there is great science to be learned as well! You will notice as the gelatin cools down it gets thicker, or more viscous. When the gelatin is hot the food coloring moves easily through it, but as the gelatin cools down and hardens, the food coloring doesn’t mix in as well. My kids had so much fun coloring this batch that they had to rush at the end to get in all the colors and glitter before it firmed up completely! Watch as the days go by how the Christmas window gel clings dry out. They start out squishy and plump, but within a few days they will be paper-thin plastic-y shapes on the window as the water evaporates out of them. My kids touch them every day to see how they are changing. These look great! 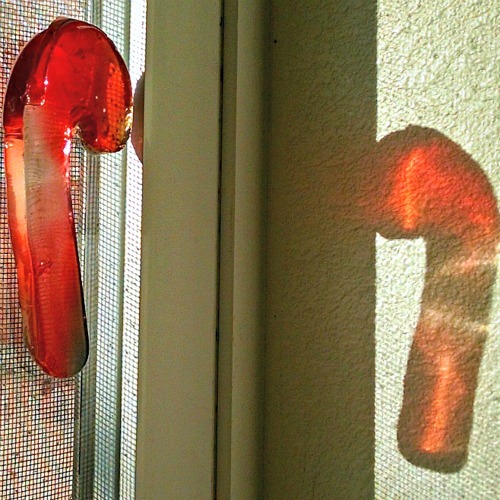 We tried window clings in the fall but we used glue and dish soap and unfortunately it was a fail for us. I can’t wait to try it this way. My kids always love applying them to the windows and sliding glass doors but the store bought ones can be pricey. Can’t wait to try, thanks for sharing on our FB share day! I hope these work out for you! My kids really look forward to doing new window clings every season now. Thanks for stopping by! That’s a whole lot more fun than just buying them at the store! Indeed it is. It’s a family tradition now, which I love 🙂 Thanks for the visit! Great project. This has been on our list of things to do for a very long time! I’ll be featuring it in After School round up this coming Monday. Sounds like they are just a little too wet. Leave them out overnight and try again in the morning. That’s what we usually do and they work better that way 🙂 Keep me posted how they work! We have never made these, but I have never taken the time to search for the directions. Thanks for sharing at #made4kids! What?!?! This is AWESOME! I am totally doing this with my toddler. Thanks for sharing on Toddler Fun Friday!